Do you remember the first time you gazed into a bakery case of sweet treats and made your selection? My oldest son had his first trip to a safe bakery at the age of five. Having a life threatening allergy to tree nuts, baked goods are not something we can just pick up anywhere. His eyes were wide staring with excitement and disbelief as he carefully considered which donut to pick. He still talks about the place in Minnesota where he could get donuts and ice cream right from the store. If you have the chance to stop in at Yoyo Donuts in Minnetonka, Minnesota, you certainly should. If this kind of a trip is not in the cards for you, just fire up your oven, you can make donuts right at home. Who says you can’t have great donuts without leaving the house? These baked donuts prove the fact that you can enjoy fresh baked donuts right in your own home – so long as you’ve stock your cabinets with the ingredients. 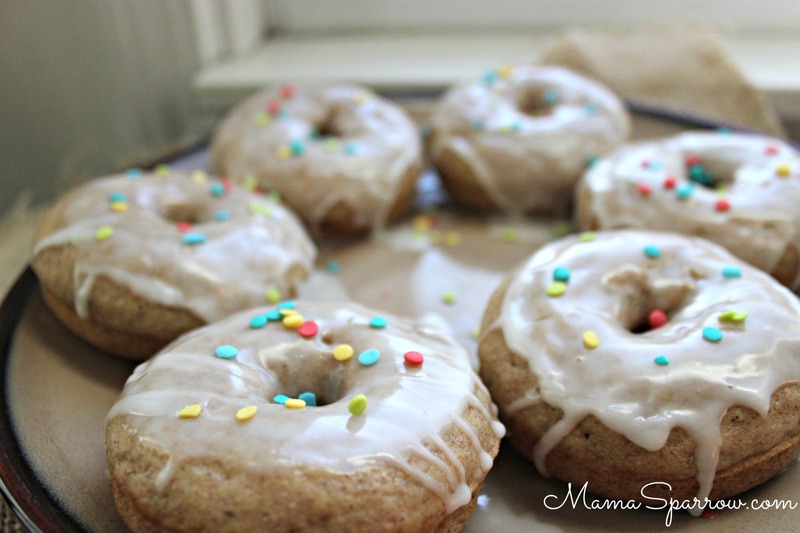 This is a no fuss, quick and easy donut recipe. It has become one of our regular Saturday treats to make these together as a family. Tender baked donuts with a hint of cardamom and vanilla. Top these with your favorite donut toppings to dress them up or down for the occassion. Spray a donut baking pan with nonstick spray and set aside. Mix dry ingredients (flour through salt) in a medium mixing bowl. Set aside. In a small bowl, beat the egg, mix in the brown sugar, milk, yogurt, spices and vanilla extract. Add and stir in the butter. Place all the wet ingredients into the dry mix and mix just until it’s incorporated. Put the mix into a large ziploc bag and cut of a corner to pipe the batter into the prepared donut pan. Bake in preheated oven for 9-11 minutes. Allow baked donuts to sit in pan for 2-5 minutes before removing the from the pan to a serving platter. Top the donuts with frosting or dip in butter and roll through a cinnamon sugar mix. Best served warm. Save leftovers in airtight container for a couple of days. In Breakfast, Recipes Tagged nut free, sesame free, soy free Bookmark the permalink.